Thousands of properties have been left without power after gale force winds hit the west of Scotland. SSE said about 5,000 of its customers were offline, mainly around Oban, Thurso and the Western Isles. Scottish Power said it was working to restore power to 500 properties in the Dumfries area. Snow has shut the A9 southbound between the Slochd Summit and Carrbridge. Snow has also made driving difficult on other stretches of the road. The highest wind speed recorded in Scotland overnight was 90mph in South Uist. There were gusts of up to 60mph in Glasgow and 66mph in Aberdeen. In Peterhead, a fisherman was blown into the harbour waters by strong winds. He suffered minor injuries. And three passengers on the ferry Hrossey, sailing from Shetland to Orkney, were injured due to rough seas and a heavy swell. A number of vehicles on board were also damaged. In the Western Isles, mobile and landline phone services were lost in the Bayhead, Berneray and Manish areas of North Uist, but have since been restored. Elsewhere on the islands, schools at Laxdale, Leverburgh and Tolsta have been closed because of power failures. 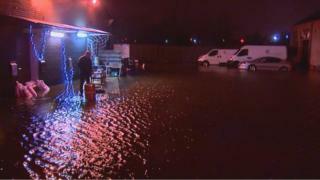 Heavy rain brought localised flooding to parts of west central Scotland. SSE said it hoped to have the majority of its affected customers reconnected later on Thursday. Scottish Power said high winds had damaged its network in Dumfries, the Stewartry and Wigtownshire. Engineers are working to restore supplies. On Wednesday, the Scottish Environment Protection Agency (Sepa) had issued multiple flood warnings as the country prepared for high winds and rain. The warnings, indicating "flooding is expected, immediate action required", covered parts of Argyll and Bute, Ayrshire and Arran, west central Scotland and Tayside. A related amber warning of severe gales had been issued by the Met Office. The alert, which applied from 21:00 on Wednesday to 08:00 on Thursday, said the winds could lead to "very high waves" and would be accompanied by heavy rain. Bear Scotland, which manages and maintains trunk roads in the North West, North East and South East of Scotland on behalf of Transport Scotland, said it had dealt with more than 65 incidents overnight including fallen trees and minor flooding.